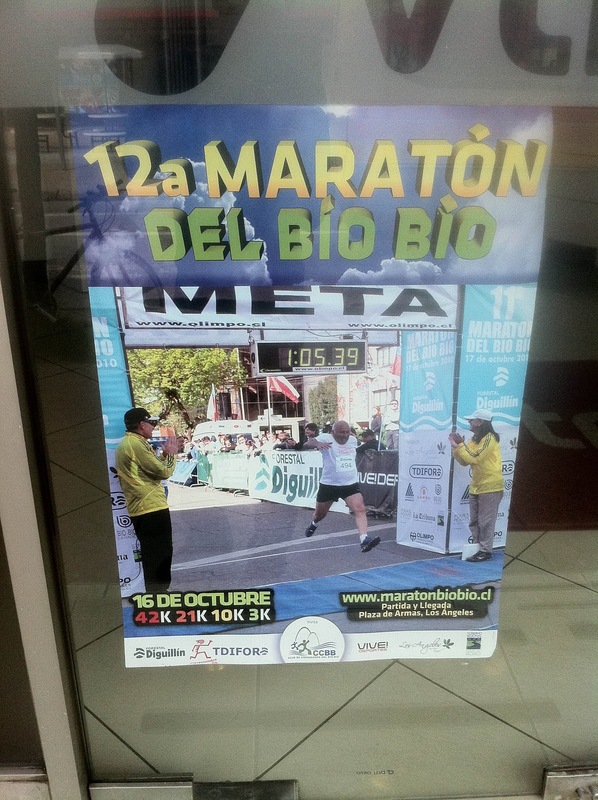 The organizers, Olimpo.cl, do not actually call their mid-October running festival the LA Marathon. But oh I wish they did. Because how better to end my quest for 7 continents by running a LA Marathon having run the California version for my first marathon (and thus initial continent). No, instead they label it based on the river that bisects the central growing region from the lake district. 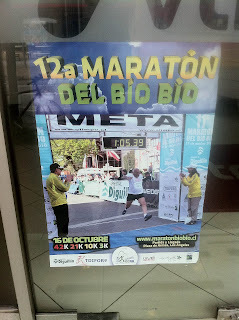 The Rio Bío Bío lends its name to the Marathón del Bío Bío running festival. Or as the director Rodrigo Salas stressed at the briefing and pasta dinner: The INTERNATIONAL Marathón del Bío Bío for a handful of us were competitors from outside of Chile. They even interviewed me twice for their video of the event and wanted to know why I had come all the way to LA Chile. I met a fellow marathon runner, Luc, from Belgium. A gentleman from Finland zipped through the half. A woman from Germany topped the woman's category in the marathon. 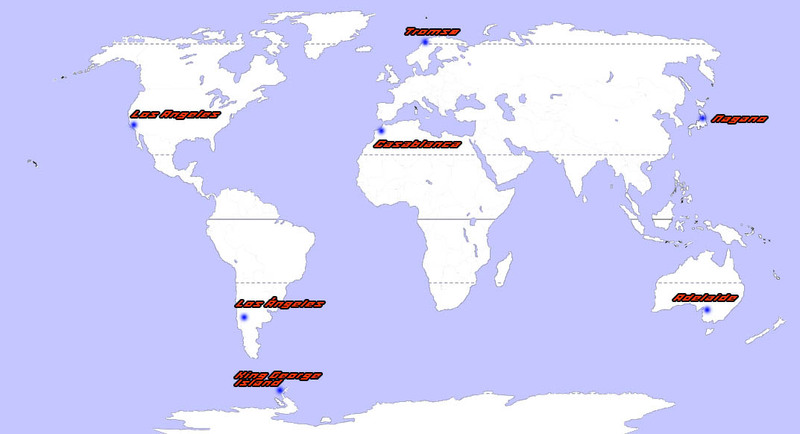 I heard mention of Peru, Colombia and Argentina as other home bases. And I even spoke to a native of Los Ángeles (the Chilean one) who now lives with his wife and two young daughters in San Francisco (the California one as Chile has one too). This marathon sounds major, huh? This was the smallest marathon I can even contemplate being a part of! While there were hundreds of runners in the half, 10k and 3k (mostly kids in that one), the marathon boasted sign ups of 22. In the end, only 15 ran. 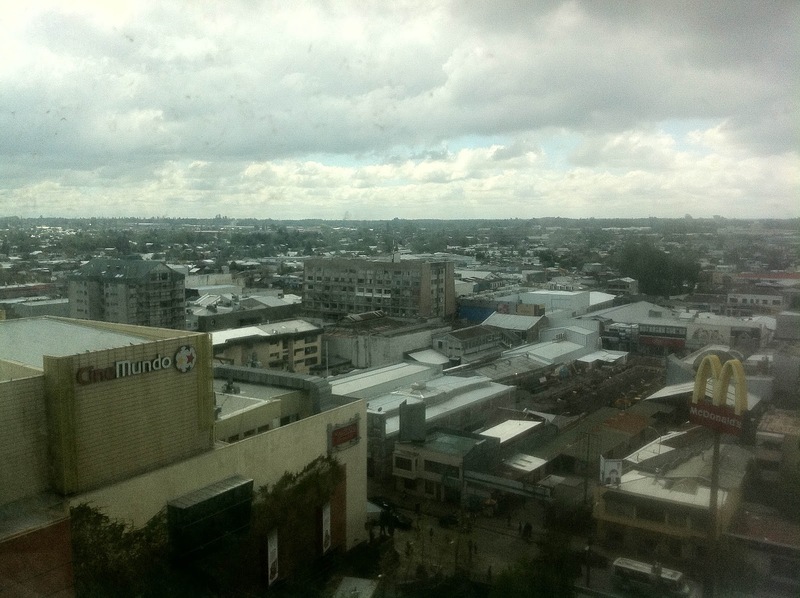 Los Ángeles is the seat of government for the region (Bio-Bio). 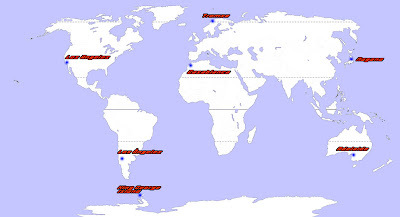 Sitting inland by about 2 hours from Conception, the city also can be reached easily by the Transamerica highway, a long I-5 like road reaching throughout almost all of Chile. It's even labeled Ruta 5, and I believe it connects to a system of roads, including I-5, that allow one to drive almost all of the Americas from Alaska to Tierra del Fuego. So, the two LAs are even linked by freeways. The town's population is about 140,000. Older than the bigger LA, the town was founded in 1739 as a fort to defend key again native attacks towards the Spanish. I am not entirely sure what is the main economic aspect of Los Ángeles, but it is in the middle of a large amount of growing areas, so more than likely agriculture plays a part. As an old city, the streets are mostly one lane and full of single direction traffic flows. 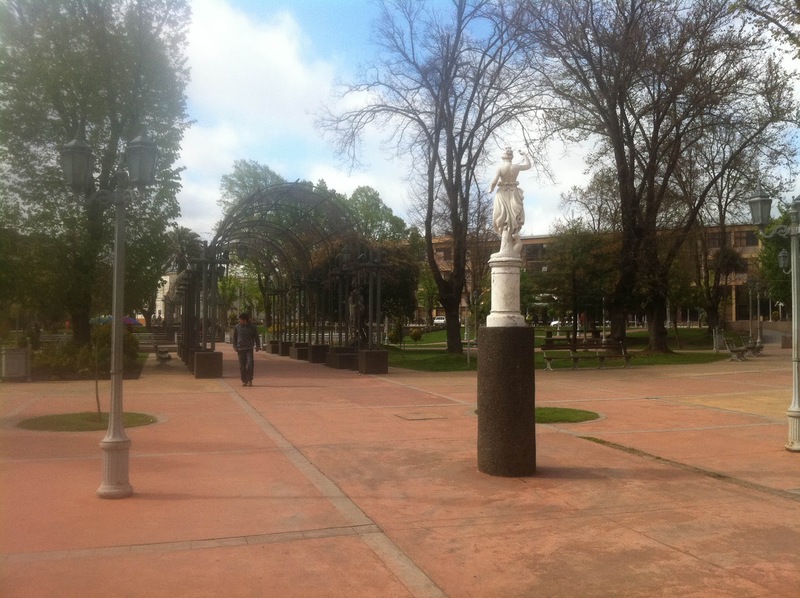 The center of the town, and the start and end of the marathon is a pleasant Plaza des Armes complete with a statue of Chilean liberator, Bernardo O'Higgins. The day before the marathon, an art fare filled part of the square. 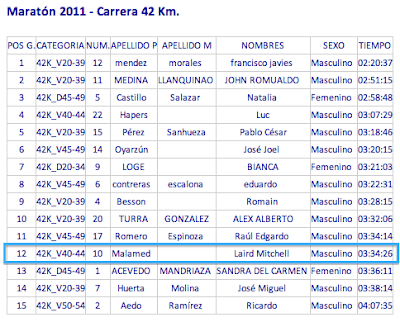 Even with my rather poor Spanish-skills, I never felt lost or unaware of what to do for the race. (And they stated the main part in English at the briefing - the 9 AM starting time.) I had fun actually trying to speak Spanish, and I even survived a trip to the grocery store including buying sliced turkey and bread to make sandwiches. I found this part of the adventure. 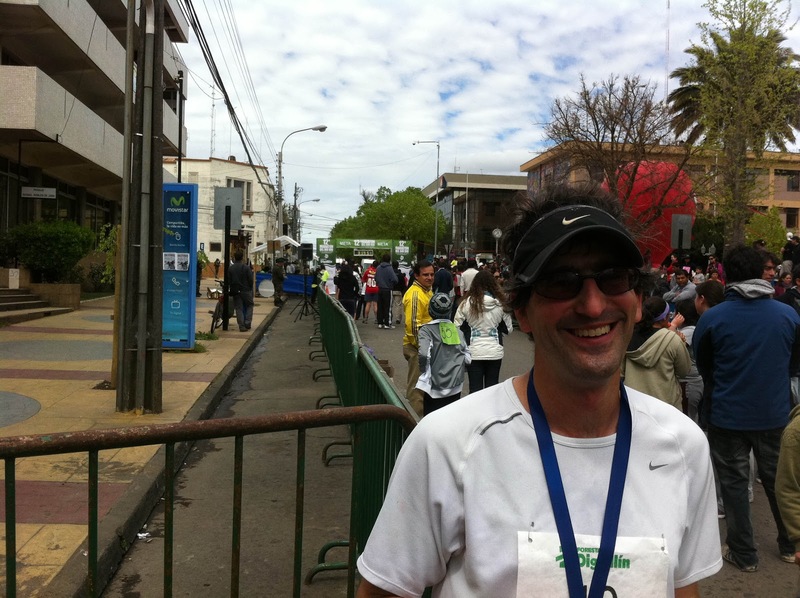 In fact, just trying to register for the marathon in advance had required multiple emails, help from the host hotel and then wiring money to Chile. The cost of the wire almost equaled the entry fee - both about $35. The full marathon, the half-marathon and the 10k all start simultaneously. At about 1.5 miles, the 10k splits off for their return trip to the square. Then at about 2.75 miles, the half veered left while we few marathoners went right. The course was a big Y starting at the bottom of Y. We headed northeast to the end of the right fork, and then reversed our course back to the intersection point (where the half-marathoners had turned), ran the left leg and came back into town. Once I departed company from the half-marathoners, I pretty much plodded along alone. Eventually, a motorcycle policeman idled up beside me. (Police here are called Carabineros.) He said he would ride with me. And in fact, he basically escorted me on the road for the next 15 miles. The entire marathon was run on open streets, and while LA Chile has 1/100th of the cars of LA California, the roads aren't huge. I never felt at risk, but my Spidey-sense was engaged. To his credit, my personal Carabinero knew how to do this. First, he always stayed a bit back so I did not have to breath his fumes. When he did go ahead of me, say to a hill or blind corner to warn other drivers to be careful, he turned off his engine. He wore a muffler over his mouth, so I couldn't understand him very well, and we did not converse much. I eventually passed a few other runners, and he stayed back with them. So, sadly, I did not get to tell him gracias. Due to the out and back nature of the course, I saw everyone in the marathon a few times. The winner blasted out a 3:20 time which was a new course record. I can tell you that he two times I saw him coming back from a turn around spot, he was booking. The aforementioned Belgian, Luc, ran a sub 3:10 as a tune up for a trial marathon in November. He was quite pleased and came in 3rd in the males (4th overall). As a fellow 40 year old, his time topped our 40-44 category of 2 participants. He smiled when I said congratulations to him in French and responded "Merci." Gatorade and water stops were every 5k. The water was kept in big 3 gallon jugs. Not sure of its pedigree and wishing to avoid any stomach discomfort, I opted to Gatorade. I never drink the stuff, but I only had brought one bottle of water with me, and that wasn't enough for the race. I cut down on the gels I normally eat to compensate for the sugary water. No issues surfaced from this decision. If you have been reading the past few blog entries, you know I have tried to move past carrying about the time as a measure of fun or accomplishment. And while I am super thrilled with the results, running this marathon well makes for a more pleasant pat on the back. My first half and second half times both added up to 1:47 or so, the second half probably being 30 seconds longer. Close enough for me to call them "Even Splits." Additionally, I went out conservatively and kept myself from being pulled to run at the same speed as the quickest 10k and half runners. I laid down the first 6 miles in 47 minutes - basically a 8 minute pace. In >20 mile runs, I pepper in some short walk breaks. After my first one, I then peeled out 9 flying miles at 7:45 pace. The course undulated up and down (max elevation gain of 500 ft for the entire race - ultimately net 0 since it started and stopped at the same point), and I kept myself from overdoing theshort downhill sections. I even got to tackle my friend the wind (see Nagano and Adelaide for more on wind). In fact, the final 8 miles were all upwind. I finished at an 8 minute pace just like I started. All told, one very excellent jog through central Chile. The race director greeted me as I finished. He spoke English, so we had a nice conversation. Turns out he co-organizes the Rapa Nui (Easter Island) Marathon with Thom Gilligan, owner of Marathon Tours and Travels, and founder of the Antarctica Marathon. He gave me his card so he can send me a finishers certificate. I then stuck around the next 90 minutes for the awards ceremony (which is cool since I got that extra medal). Funniest award: Best finish by a father carrying a small baby. The winner got a baby carrier. Ok, Laird, enough with the facts: How do you feel? In short, yesterday (October 16) was a tremendous day. I had been so busy this past week both with touring while on vacation and with work, that only the day before did the enormity of the final marathon hit me. (Photos and thoughts on visiting Rio and Santiago coming soon, I promise.) Besides my run, we launched my last game at Activision, Skylanders. And all accounts say this was a great launch. Toys selling. Games selling. People registering for the online version. So, running the marathon and then starting to get all these cool updates and notices in email after just continued to propel the emotion of the day forward. Believe me, making a game is a lot harder than running a marathon! I know some fellow game makers would disagree, but a marathon requires practice, patience and probably about 6 months time. A game like Skylanders took 3 years and thousands of people in some capacity or another (about 200 fully dedicated). When you go out to run, you know what will happen. Sure, you could get injured or have an off day, but in general, you know what will happen. 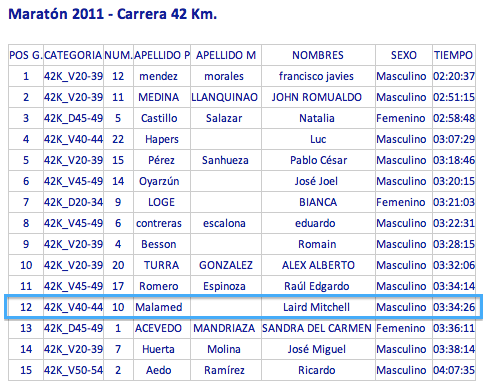 I knew, barring my body giving out, I would run a sub-4 hour race. Figured a 3:45 was almost assured. Sure, I did 10 mins better than that, but even that time wasn't a huge surprise. In the past 14 months, I ran 3:31 and 3:36 at Adelaide and LA respectively. Around mile 20, I could have walked the rest of the marathon and still finished within the 5 hour max time limit. So, I was confident I would complete the quest. In fact, once I made it to Los Ángeles on Friday night, I felt very confident. Still, you do not flaunt the marathon. Being confident is not the same as being cocky. I enjoyed the run because I listened to my body. Nothing got me upset or thrown off. I just kept running. Run, Laird, Run! Today, I have something much more enjoyable than a high that dissipates quickly; I feel a sense of calm. Queue the Brian Eno atmospheric music. Planning and running on seven continents requires patience and planning, training and performing and a bit of cash. These are the stuff of long moments, not short instances. In fact, the parallel to making a game continues in this vein. While the excitement of a launch is a singular moment, the work leading up to that day is full of small decisions that add up like so many footfalls through practice runs and then races. A game culminates because of years of dedication and persistence and staying focused on a goal. So does a marathon. In short, I feel a deep sense of thankfulness not of having only finished but of having journeyed. From those first tentative steps in February 2006 down my block - huffing an puffing 30 lbs heavier than today, to the trot across the line yesterday, I never gave up, never doubted I would finish. I enjoyed almost every moment. To those who supported me in one way or another, I say thank you. For the charities which you have donated to, they say thank you as do I. For those who have told me I inspired them, I am humbled. And to myself, I say "Well done."